Is there a proper greeting for Ash Wednesday or Lent?? “Happy Ash Wednesday” or “Happy Lent” don’t really seem appropriate… Anyway, I guess a ‘happy Valentine’s day’ is also in order! It’s so odd that Ash Wednesday falls on Valentine’s day and Easter falls on April Fool’s day this year, right?! You could give it up completely, or for a day or week, or just limit your usage to certain times of the day. I’ve found that reducing the amount of time I spend on social media greatly improves my mental health and self-image and gives me more time to spend on more important things, like prayer and writing. This is a tough one. Again, maybe it’s not something you can give up completely, we’re all human! But it is something you can be more mindful of. How often do we do this, without even meaning to?! Taking #2 a step further, I think we can always be kinder in our thoughts and words about others. Let’s lift each other up, friends! This. is. so. important. I cannot stress the importance of self-care and self-love enough. Your image of others and outlook in general starts with you and how you think about yourself. Choose to love yourself more this Lent, and I think you’ll learn to love others more, too. This goes hand-in-hand with #4. In the busyness and craziness and not-stopping-ness of life, it can be really easy to forget to care for ourselves. Between rushing to meetings and getting everything done on time, we sometimes get so caught up in doing everything for everyone else that we forget to care for ourselves, and that’s really not what God wants for you! This Lent, let’s give up neglecting ourselves and remember that (like Emily Ley says in this book), you can’t pour from an empty well. 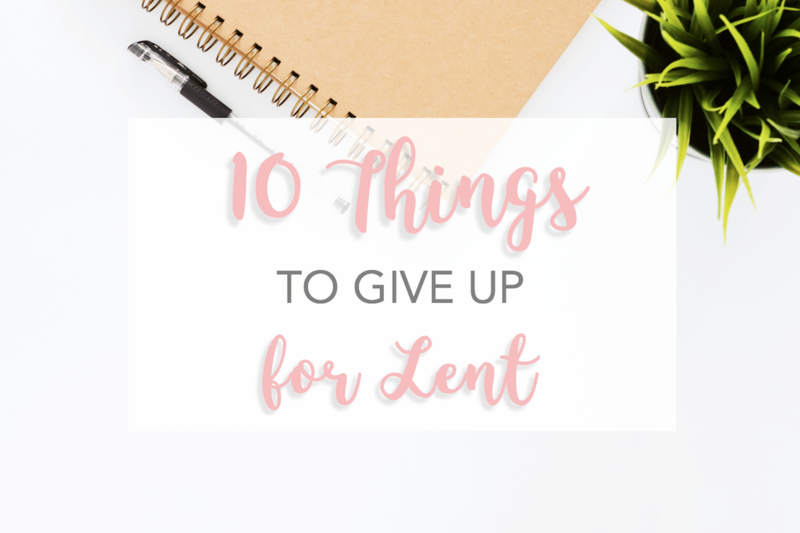 Think – all those New Year’s resolutions that sounded so good a month ago… This Lent, choose to focus on the follow-through, or give up committing to things when you’ve already got enough on your plate. This has been my focus this year, and I plan to continue this during Lent. I’m a self-proclaimed shopaholic… But Lent is a good time to think twice about purchases and more carefully consider the way we spend our money. God created our hearts so that only He could totally fulfill them. Another tough one… This is something I always struggle with, but it’s another good thing to try to focus on and become aware of this season. How quick are you to become impatient with others? In the car? In line for things? When people don’t respond right away? Focusing on tackling impatience is a big challenge, but offer the anger to God and pray for improved peace in your life! Still holding on to grudges and wrongs for days, months, or even years? Like impatience, Lent is a good time to hand these troubles and habits to God, and truly work on improving ourselves to become better, more loving Christians, which should always be the goal, right?! God’s already forgiven whatever you’re still holding onto, so take this season as chance to practice forgiveness towards yourself and others. Like I talked about in my last post, Lent is a season of preparation for Easter. Not all Christians celebrate Lent, and not everyone ‘gives something up’. Choosing to participate in Lent (be it adding something, giving up something, fasting, etc.) is a personal decision and whatever you choose should lead you closer to Christ. Today is Ash Wednesday, which is the beginning of Lent, but just because you don’t start your ‘something’ today doesn’t mean it’s too late! I encourage you to think about it and pray about it, and then choose something that works for you and your life! And whatever you do choose, be kind to yourself! Y’all know I’m about progress over perfection. Don’t quit just because you mess up one day. Keep trying! And remember, our God is all-forgiving, always loving, and already knows the intentions of your heart. Thanks for reading, (and thanks to my sweet friend Hayden for inspiring me to keep posting about Lent) and may you have a blessed Lenten season. Kristen, a lot of your blog sounded like you were talking about me, really hits home.